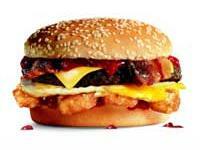 Somehow I hadn't noticed this Carl's Jr. breakfast item before... the Breakfast Burger. With a mere 830 calories and 47 grams of fat you can get your morning's supply of beef, egg, bacon, cheese, potato and bread. By comparison, Carl's 'Big Burger' has 520 calories and 18 grams of fat. The Breakfast Burger is "a charbroiled all-beef patty, fried egg, crisp bacon, american cheese, hash brown nuggets and ketchup on a sesame seed bun." It has 830 calories, 65g carbs, 37g protein, 47g fat, 15g saturated fat, 275mg cholesterol, 1580mg sodium. Is this a rip-off of the Good Morning Burger? How can you go wrong..Dah Well the Double six dollar burger turned out to be $7:59 plus tax .